Is your garage door off track? You can either fix it yourself, or call a professional for help. Because the door is off track and sits above you, it’s important to be careful. You don’t want to try and “force” the door back on track, and you shouldn’t allow children, pets, or anyone else near the door until it’s back on track. Also keep in mind that while your garage door doesn’t work, your home unsecured as well. First, check overhead for the rope that connects the door to the opener. Release the door from the opener by pulling on the rope. This will allow you to manually operate the door. Lift the door to open it manually. Be careful during this process as the door of the garage is heavy and can slam down on your body when trying to open it. You may have to get another person to help you do this, depending on the door. After the door is open, locate the wheels that are sliding off track. Open and close the door again if you do not immediately see the jamming wheels. Doing this may be a challenging task for a first time DIY novice, therefore, you might need to call for technical support if you can’t locate these. Once you have spotted the jamming wheels, you must put a stop on the tracks. To do this, simply clamp the locking pliers beneath the door on one of the tracks. After the tracks are secured using lock pliers, get ahold of the outer edge of the tracks with a pair of pliers and pull it in the opposite direction. This will give you room to get the wheels back onto the track. When the wheels are well positioned, knock the track with your rubber mallet until it’s back to its correct position. This is what brings the door back on track. It is important to manually check whether the door is operating correctly and test it’s balance. You can do this by removing the lock pliers from the track, then move the door up and down manually. Once you have determined that the door is operating well, both manually and while hanging straight, try using the garage door opener. Press the button on the remote control to activate the opener. Allow the garage door to fully open and close in order to secure the door release mechanism. If the door does not open at the press of the remote button, is hanging crookedly, is jerking or making some grinding noise when moving, it means that something is wrong. 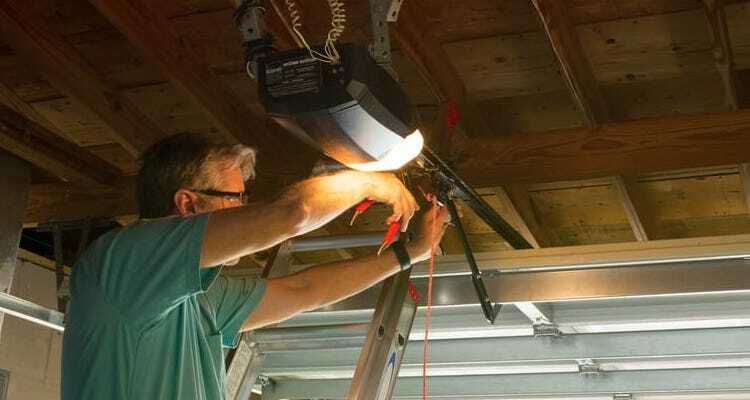 You can try to troubleshoot after this, however, contacting a garage door technician will help greatly.